Wow – look what you’ve done! Together, we have had the courage to create a school that now serves 266 students. We have 25 graduates attending junior high (right). We’ve never had a student drop out. We are building a library. 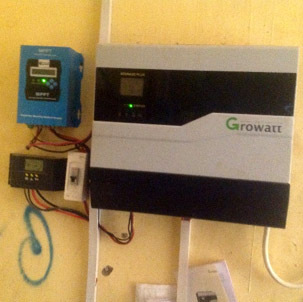 We have outfitted a solar-powered computer lab in a locale without electricity. We teach children how to read and write English. We have dealt with surprises and crises with honesty and hard work. What a feat. And what a responsibility! Eight years ago, Yaapoa Miba (left) was a timid little girl in the village of Bumboazio, Ghana with no prospect of getting an education. There was no school nearby for her to walk to. Her parents, themselves non literate, could not afford to send her away to a distant school. Today, Yaapoa (below) has completed her elementary education at La’Angum Learning Center. 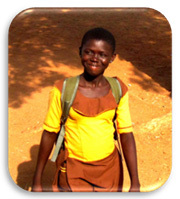 She is now a young student in seventh grade, with many dreams of a brighter future. You made it possible for Yaapoa and 24 of her mates to complete their elementary education successfully and to embark on the next phase of their education journeys, stepping into junior high confidently. Your continued support has given Yaapoa and many other children in this rural community in northern Ghana the audacity to dream of a better future not only for themselves but also their families and their community. This last year has brought challenges that we never envisioned. Yet we had unwavering support from you, our caring friends, who generously stepped in with emergency funding. Thus, our water crisis is over. The big tanks no longer leak, we have some temporary supplementary containers, and the school can continue to function. Is this enough? Unfortunately, no. We still need significantly more water storage capacity. It is part of our infrastructure that has not yet kept pace with the growth of the student body. 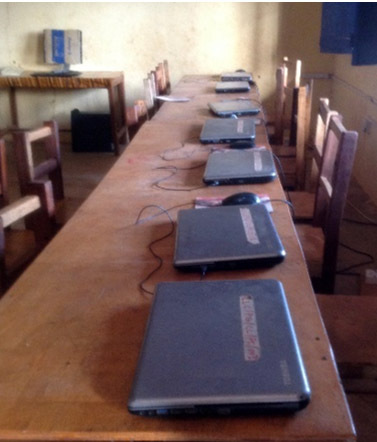 Similarly, the computer lab is a wonderful asset, but its six computers are not nearly enough for all 266 students. Your previous gifts built the lab building, which will comfortably house more computer stations. But our solar electricity generation is at capacity. 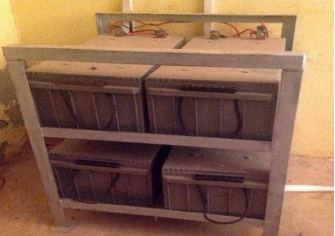 To add more computers will also require additional solar panels and battery storage. The payoff? A much richer experience for each student in this important, and necessary technology. Another crisis from the past year has yielded a new line item in our budget: screening all incoming students for Hepatitis B. This wasn’t in our first budget, eight years ago. But when we discovered this destructive illness in some of our students, we were confident that you would help us with the immediate problem, and you did. 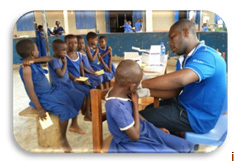 Through your special gifts, we screened and vaccinated every student and teacher. And we treated those who were infected. And we’ll continue each year, screening all incoming students. For some, this will be life saving. This next year will be an important time to focus on what happens inside the classrooms, developing, strengthening, and enriching the quality of our students’ learning experience. Because a school is far more than a building. This work will involve individual teacher coaching, formal training with curricula and materials, demonstrations and workshops. We will continue to pursue and refine assessments and comparisons of our student outcomes for grades 3 and 6. We’ll also continue to follow the progress of our graduates to ascertain how LLC can best prepare students for success in junior high. Most of these items are contained within our annual operating budget – they’re what we do. While they’re not flashy, they are crucial. Your continued support today for these bread and butter items enables us to deliver what we have pledged to our students. Long term, through our endowment fund, we aim to create a reliable source of income that will sustain the school’s normal operations. This will take years to build, but we’ve already started that important work, and we welcome your participation. 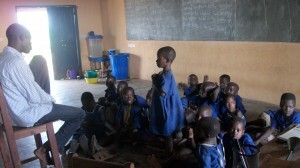 La’Angum Learning Center became a reality because of your generous spirit. 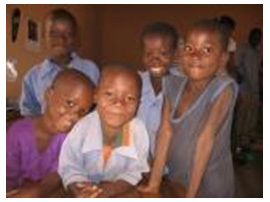 It has grown because you continued to care about the children and their futures. You expected your dollars to work hard, and they have yielded so much more than anyone originally expected, because your gifts impact more than the students – they help families and communities grow stronger together. We say at La’Angum Learning Center, “Sirinsaa yani, la’angum ka toom,” which means, “Many hands make light work.” We welcome you to join our work - together we will make another year come true for today’s 266 students. Reach your helping hands across the Atlantic to ensure a sustainable future for those students who come next. By your caring gifts, we bring to life our hopes and dreams for the future. 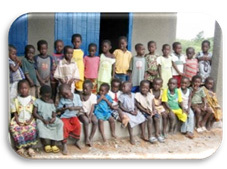 We greatly appreciate the support of our PAMBE Ghana donors and friends! This group is volunteer driven, so your feedback is always appreciated to ensure we are doing our best for the students in Ghana. We hope you had a chance to review the end-of-year giving letter in December. We hope you felt as inspired to give as our friend, Frank. We love hearing from you! 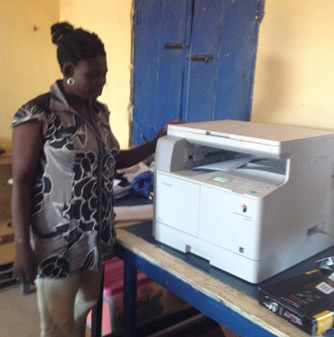 "Please pass along to Alice how much the PAMBE Ghana annual appeal letter impressed me. No pics of the executive director receiving an OKC Citizen of the Year Award or shaking hands with local politicians, or of board members with a proverbial shoulder to the wheel; no emotional "poor us" language and no sleep-inducing budget report. Just straightforward, matter of fact details based on what needs previous contributions have helped meet in the past and what needs additional contributions will meet in the future. Good stuff. Alice's letter stood out. Well done! Carol and I didn't hesitate to double the small donation we intended to make. (The little bio on the young lady who had just completed seventh grade didn't hurt either.)" 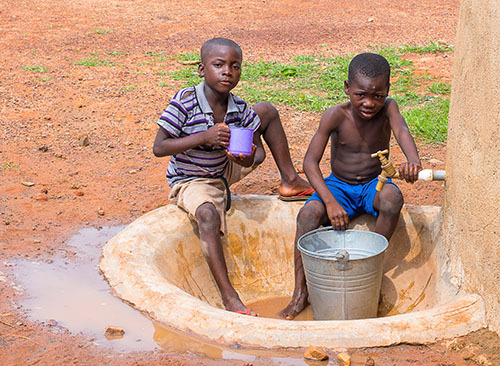 Our New Water Well is a Success! 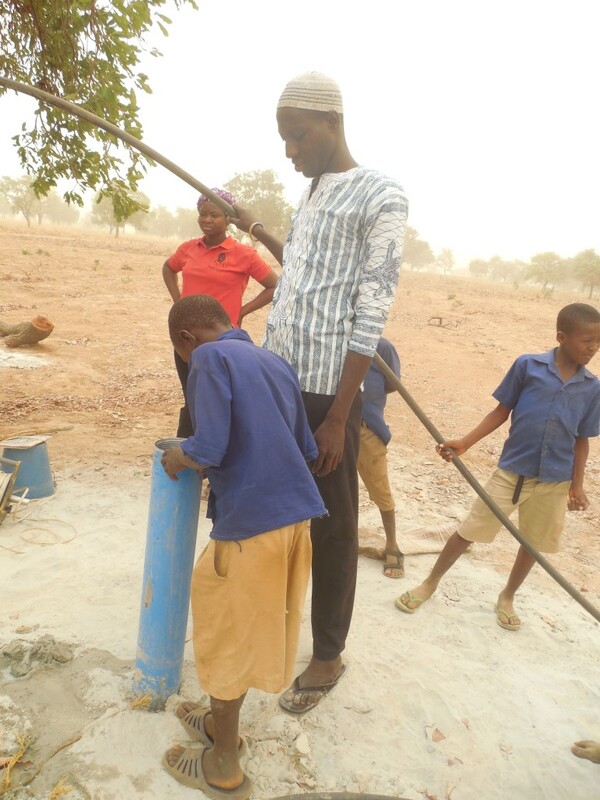 Our bore hole has passed the pumping test in time when the world celebrates Water Day on Sun. March 22! We had been waiting for this day with much anxiety because the outcome of the pumping test would determine the fate of our bore hole. The team arrived this morning around 10:00 a.m. and set up their testing equipment including a submersible pump and a diesel powered generator. The water had risen to 41 meters and thus boosted our hope for a good producing well. 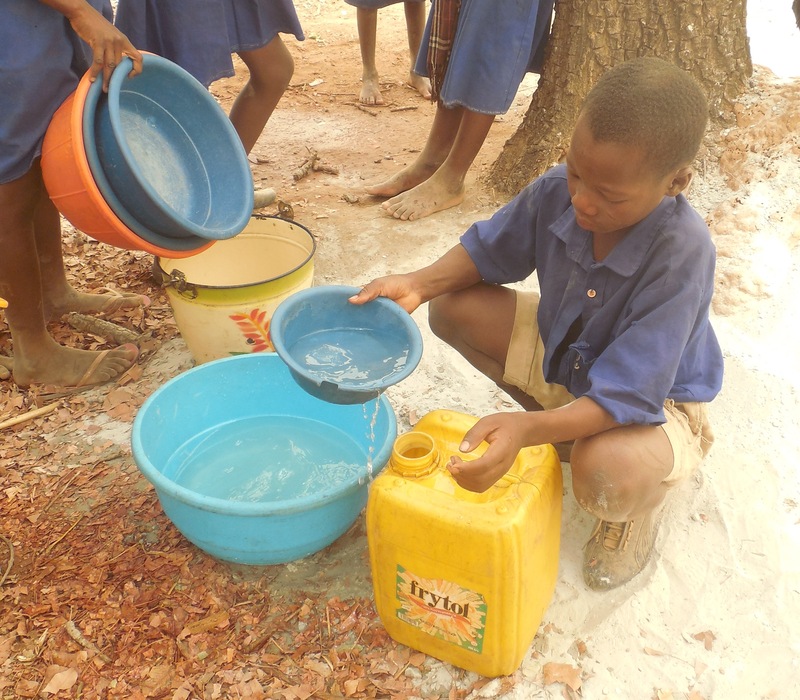 As word went round about the pumping of water, students ran out with gallons and other containers they had used to bring water to school. We all watched with excitement and some uneasiness as the water flowed out slowly. I later learned that the technician intentionally regulated the flow so it is constant to aid their observations and recording. The pumping went on for two and half hours, non-stop. The children gradually filled their containers and took them to their classrooms. Every container, big and small got filled up. The water was clear and tasted okay. The technician assured us it was safe to drink it. The team took a sample to do the quality test in Tamale. 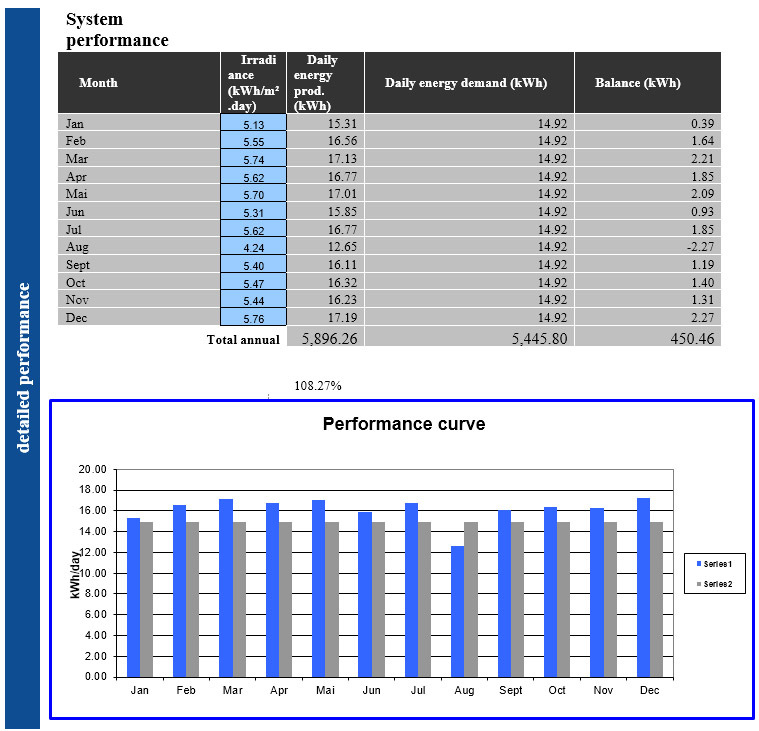 Then the team proceeded with the even more telling test: the recovery or recharge rate. How quickly does the well replenish itself? 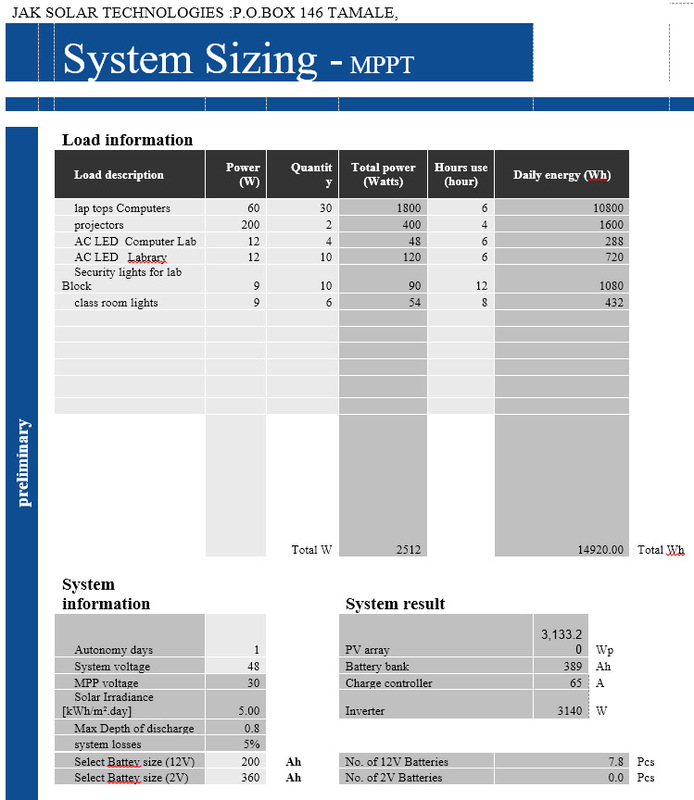 After an hour and half the technician declared the recovery rate to poor. However, he recommended going ahead to develop the well, given that it is the best bore hole we would have for LA'ANGUM. With a bottle of water he demonstrated how the water indicator (like a tape measure), which beeps when it comes in contact with water, was used to determine the recovery rate of our bore hole. "The recovery rate is low. But half a loaf is better than none," the technician reminded us of this old adage. The technician did not think our bore hole is a good candidate for mechanization. He advised the installation of a hand pump instead. 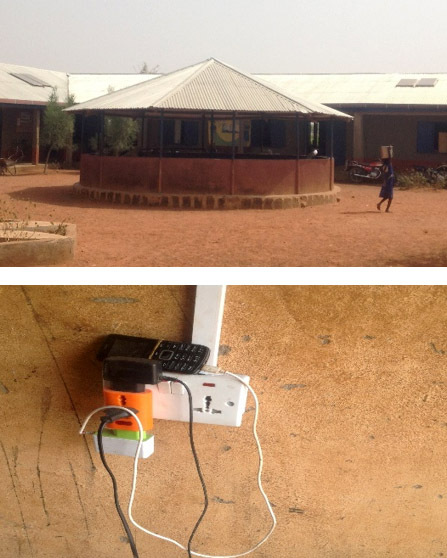 Recognized by Oklahoma A+ Schools and local independent schools Oklahoma A+ Schools has announced that the La’Angum Learning Center in Northern Ghana has been awarded the status of an Associate School for 2013-2014. 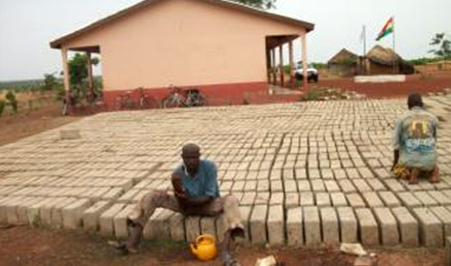 Established by Oklahoma City non-profit organization PAMBE Ghana in 2008, the La’Angum Learning Center provides culturally rich, bilingual early childhood education to underserved children in northern Ghana. 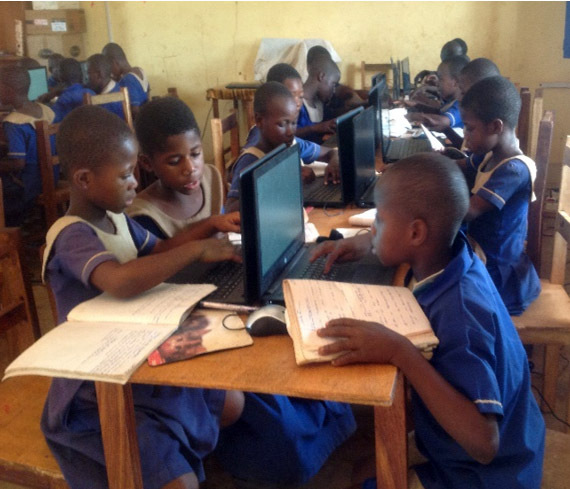 Located in the East Mamprusi District, an extremely impoverished area, the La’Angum Learning Center currently educates 131 students in preschool through second grade, and proudly owns a zero percent dropout rate over its 5-year existence. 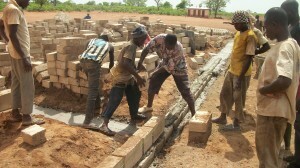 With financial support by PAMBE Ghana, Rotary International clubs in Canada and Ghana, and individual donors, and with the on-the-ground collaboration of local Ghanaian volunteers, construction on three new classrooms and a rainwater harvesting system was begun in Spring 2013 to support expansion of grades 3-6. Children and faculty of local Oklahoma City schools have also offered strong support to PAMBE Ghana and the La’Angum Learning Center. Most recently the beneficiary of proceeds of the Heritage Hall 1st grade art show, PAMBE Ghana will also be honored by Westminster School on May 22, as one of three non-profit recipients of funds raised by the 5th grade class in its read-a-thon. For more information about PAMBE Ghana, or the La’Angum Learning Center, please contact us at PAMBEghana@gmail.com. The Classroom building project is on course. We have about 3000 cement blocks, 200 bags of cement, trucked in by tractor and my pick up. The teachers offloaded all these bags! (1 bag is 50kg and cost GHS22). We also have iron rods, nails and other accessories for the pillars and lintel. Workmanship for the masonry work to roofing level will cost GHS3,000, excluding the community’s contribution in labour, water supply and stone chippings. Cement molders have just finished the last batch of blocks. The molders are paid GHS 0.20 per block. The community chose last week, Saturday, to begin work on the site. Parents gathered in the school; the mason and his assistant demarcated and they dug the foundation. They came back last Thursday to break stones into small pieces for the foundation. With the appeal and encouragement from teacher Shani, La’angum school children brought water to school yesterday (Saturday) to fill a container for the building. Saturdays and Wednesdays are believed to be good days to begin a good project, because it is believed that things that happen on these days are very likely to reoccur. We don’t have enough stone chippings, but the community leaders have maintained that they will get more broken for laying the foundation. Next, rendez-vous is coming Wednesday, to lay the concrete foundation! The year 2010 is already half gone and PAMBE Ghana is moving forward with its agenda for developing a model of quality education. The 2009/2010 academic year began on September 15, 2009 and will end July 29th. It is a delight to observe the changes in the children, their curiosity and interest in life around them and their smiling faces. PAMBE Ghana has recruited Mr. Baba Bukari as our new Executive Assistant. He is taking responsibilityfor supporting the Executive Director in the areas of accounting and financial management, administration, logistical and coordination support, information systems management, internal and external communications. Baba's start date was June 15, and already he is showing himself to be a valuable member of the PAMBE Ghana team. More about Baba's background will be posted shortly.